Tony Perkins Takes Credit For Houston - Joe.My.God. A digital ad campaign by FRC Action’s Super PAC, the Faith Family Freedom Fund, was seen by nearly 300,000 Houston residents in recent weeks. Last year, Family Research Council (FRC) organized “I Stand Sunday,” a live simulcast featuring Christian leaders including FRC President Tony Perkins, Gov. Mike Huckabee, Dr. Ronnie Floyd, Dr. Rick Scarborough, and the Houston pastors whose sermons were subpoenaed by the city’s mayor. Nearly 7,000 people were in attendance at the host church, Grace Community Church in Houston. Additionally, 765 churches and nearly 3,000 home groups tuned into the event in all 50 states. 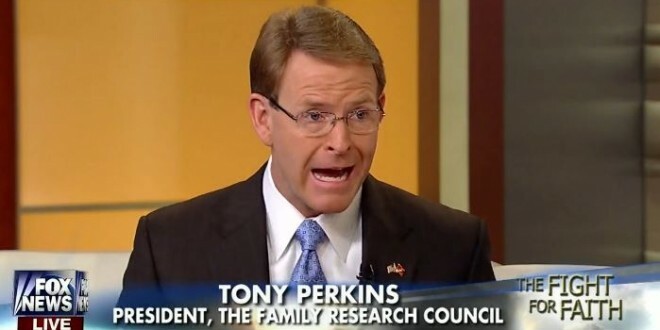 On the defeat of Houston’s Prop 1, Family Research Council Action President Tony Perkins commented: “Houston has become a rallying cry for Americans tired of seeing their freedoms trampled in a politically correct stampede to redefine marriage and sexuality. Houstonians sent a message heard across the country: They will not allow the government to flush away their money, and more importantly, their values and religious liberties. There will be lots more celebrating tomorrow from the usual haters.